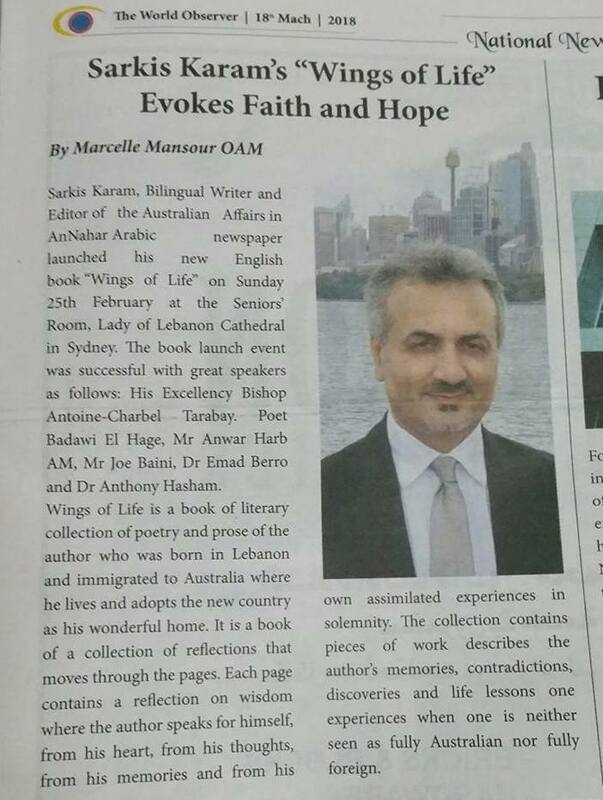 Sarkis Karam, Bilingual Writer and Editor of the Australian Affairs in AnNahar Arabic newspaper launched his new English book “Wings of Life” on Sunday 25th February at the Seniors’ Room, Lady of Lebanon Cathedral in Sydney. 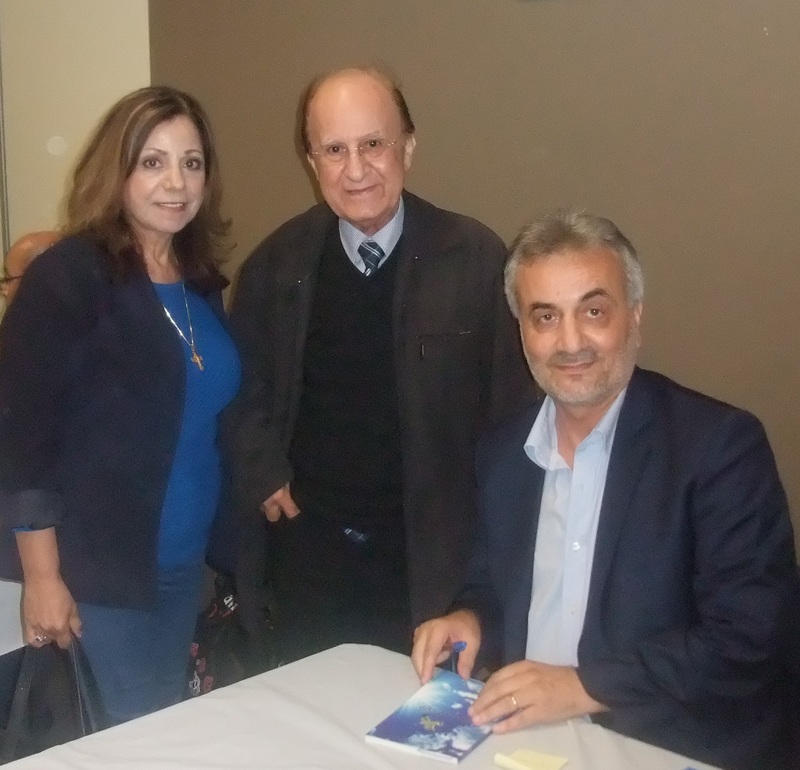 The book launch event was successful with great speakers as follows: His Excellency Bishop Antoine-Charbel Tarabay. 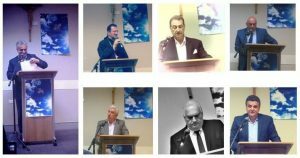 Poet Badawi El Hage, Mr. Anwar Harb AM, Mr. Joe Baini, Dr. Emad Berro and Dr. Anthony Hasham. 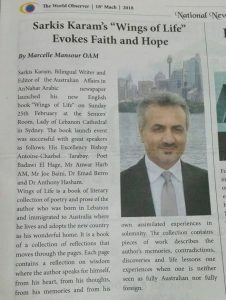 Wings of Life is a book of literary collection of poetry and prose of the author who was born in Lebanon and immigrated to Australia where he lives and adopts the new country as his wonderful home. It is a book of a collection of reflections that moves through the pages. Each page contains a reflection on wisdom where the author speaks for himself, from his heart, from his thoughts, from his memories and from his own assimilated experiences in solemnity. The collection contains pieces of work describes the author’s memories, contradictions, discoveries and life lessons one experiences when one is neither seen as fully Australian nor fully foreign. It is carried away on wings of hope. for they have dwelled in our minds…. And in his piece of prose Australia: “A shelter for humanity, a home of comfort, peace, and justice…A refuge for liberty and freedom for the expression” this great Aussie land we call home. Then in Strength, he proclaims “no strength without faith, no strength without the Lord.” For only in the Lord he finds strength as well as in the Light of Life he finds peace. To him, Ehden, in fact, is ‘EDEN’! 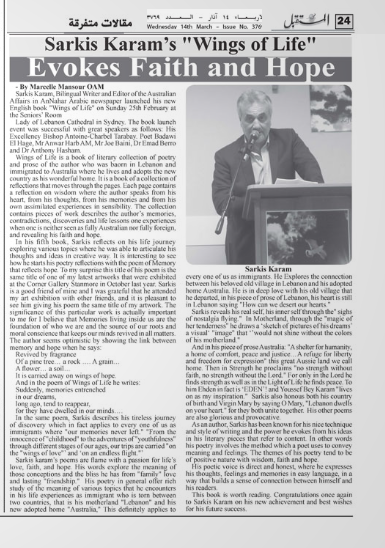 and Youssef Bey Karam “lives on as my inspiration.” Sarkis also honors both his country of birth and Virgin Mary by saying O Mary, “Lebanon dwells on your heart.” for they both unite together. His other poems are also glorious and provocative. As an author, Sarkis has been known for his nice technique and style of writing and the power he evokes from his ideas in his literary pieces that refer to content. In other words, his poetry involves the method which a poet uses to convey meaning and feelings. The themes of his poetry tend to be of positive nature with wisdom, faith, and hope. 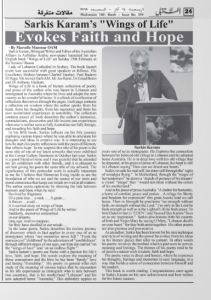 His poetic voice is direct and honest, where he expresses his thoughts, feelings, and memories in easy language, in a way that builds a sense of connection between himself and his readers. This book is worth reading. Congratulations once again to Sarkis Karam on his new achievement and best wishes for his future success.